We have launched the new Emerita yeast assist range but be quick as we have limited stock available! The only product of its kind. Dr. Peat's famous oil is extremely popular with ladies who require a sublingual (drops under tongue) product that is three times stronger than creams. Comes in an easy-to-use dispenser. Many users also report relief from hormonal migraines. The only natural progesterone cream supported by clinical studies! 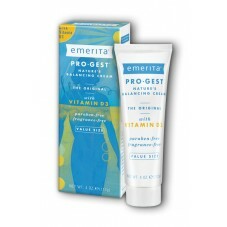 Emerita Pro-Gest has been available for over 20 years and is the natural progesterone cream women ask for by name. Health care professionals and leading physicians support its use because it is the only natural progesterone cream supported by clinical studies. In a woman's body the majority of progesterone is secreted by the corpus luteum, which forms in the ovary following ovulation. During the second half of each monthly cycle, from ovulation until menses, progesterone is designed to be the dominant hormone. Not all women produce sufficient amounts of progesterone during the second half of their cycle. Prior to menopause, as ovarian function wanes, cycles frequently occur where a woman does not ovulate (known as an anovulatory cycle). This period leading up to menopause is referred to as "perimenopause." Anovulatory cycles that begin in perimenopause can lead to hormone changes that may result in hot flashes, changes in bleeding patterns, PMS-type symptoms, as well as many other menopausal symptoms. While progesterone levels fall close to zero due to anovulatory cycles at menopause, estrogen levels may only decline to about 40-60% of pre-menopausal levels. Progesterone has a number of important roles relative to menopause. It is the natural balancer to estrogen, as well as being necessary for optimum estrogen utilization. Research over the years has also revealed other vital roles of progesterone on the heart, blood vessels, nerves and brain. Many women find that supplementing with progesterone allows them to achieve a hormonal balance once again. Pro-Gest cream is manufactured to contain 450 milligrams (mg) of USP Progesterone per ounce (900 mg per two-ounce tube). Each ¼ tsp contains approximately 20 mg of USP Progesterone. Careful clinical research has shown this to be an effective amount to achieve a natural balance. "USP" stands for "United States Pharmacopoeia", and is progesterone that exactly duplicates the progesterone naturally produced in the body.